The Slade's lively and dynamic studio-led research culture makes a significant contribution to the field of contemporary art nationally and internationally. Staff expertise covers a broad spectrum of interests with individual, collaborative and interdisciplinary research taking many forms. In the 2014 Research Excellence Framework, 79% of the department's research activity was recognised as being in the top two categories of 4* ('world leading') or 3* ('internationally excellent') while 100% of the impact of our research activity was recognised as having either ‘outstanding' or 'very considerable' impact in terms of its reach and significance. 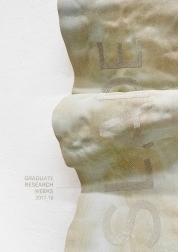 With 95% of eligible staff included in the submission, this confirms the Slade as one of the country’s leading university departments for research in Fine Art. Studio space and facilities have been expanded and enhanced in recent years and the Slade Research Centre was established in the Woburn Square studios in 2005. These pages have been designed to introduce the range and diversity of research projects both current and archived undertaken by Slade staff and students. You can Browse by topic, searching by theme or by subject area. This research project is an artistic investigation into the element hydrogen and its agency in the context of ecological art.